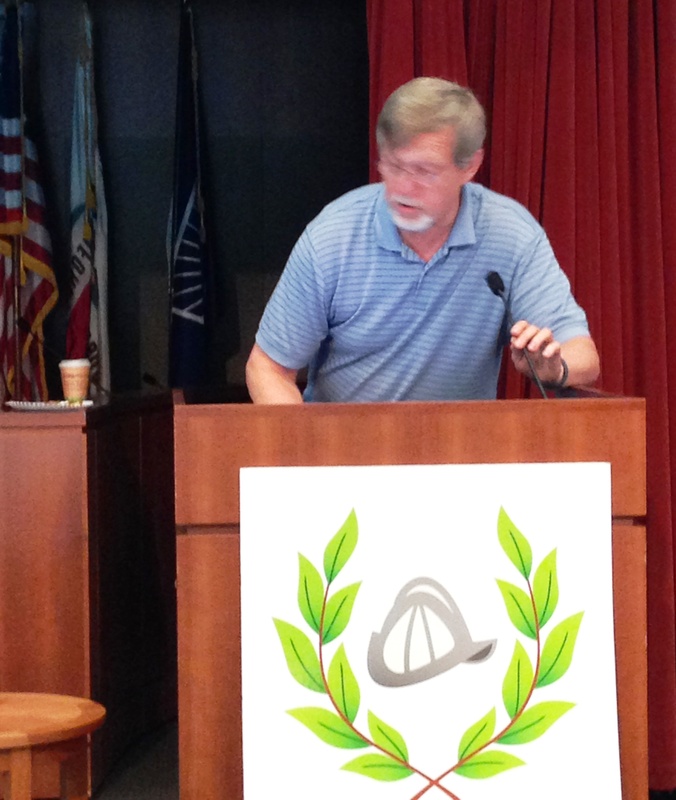 The featured reader for the morning was Lester Deanes, assistant dean at Santa Clara University’s Office of Student Life. He gave a great talk called “Man in Progress – A Conversation on Redefining Manhood and Family.” For me the highlight was a video he showed at the end of the talk of kids at a camp singing songs about gender issues. Sunday Assembly is a group that meets, sings, listens to lectures and poems, shares adversity and adventure. 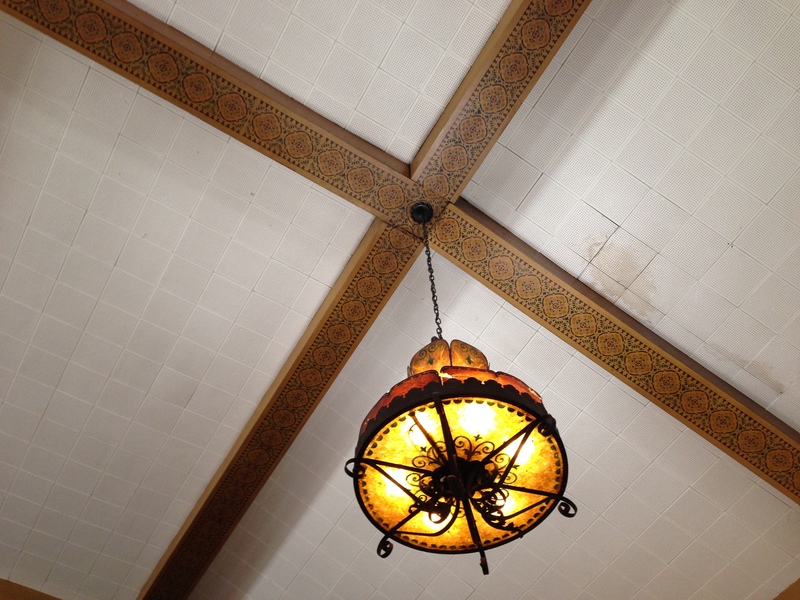 They meet in the absolutely gorgeous old San Jose Women’s Club building, which has a lovely auditorium. 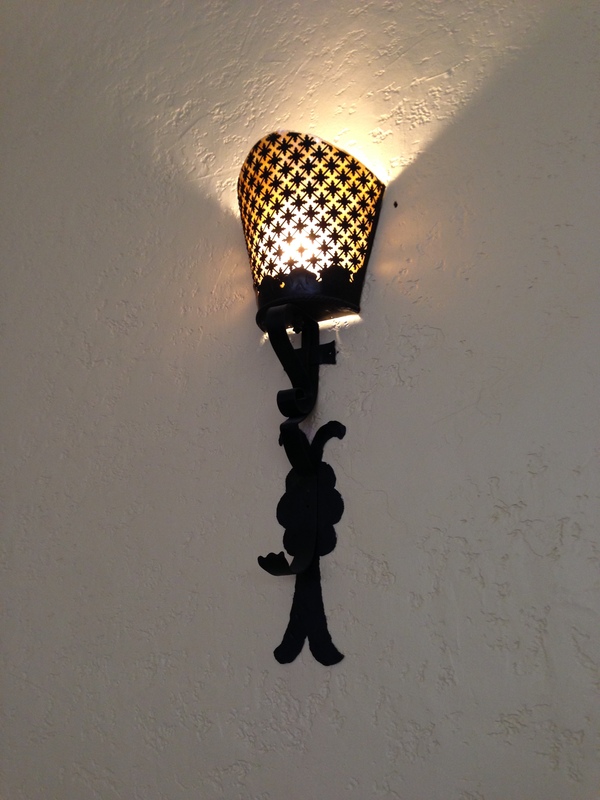 I took several photos of the light fixtures while I was warming up my poetry mojo. 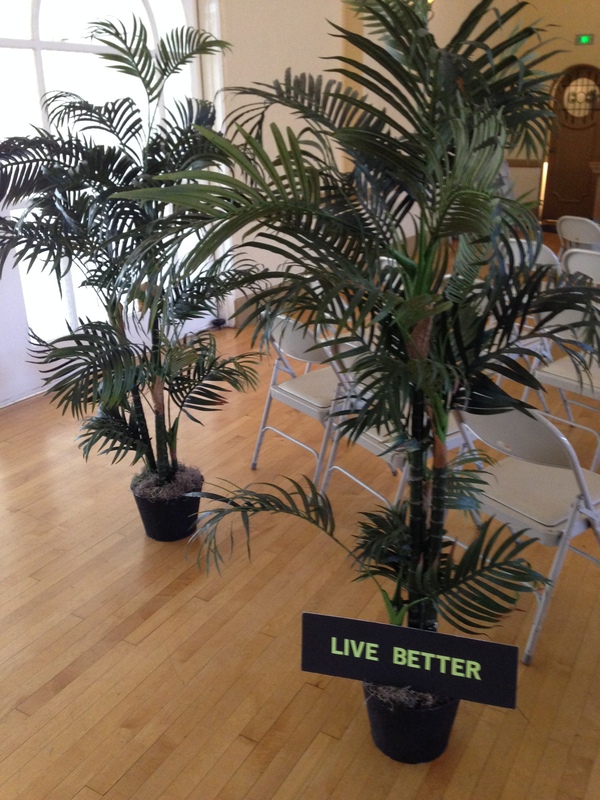 I especially love Sunday Assembly’s motto: Live Better. 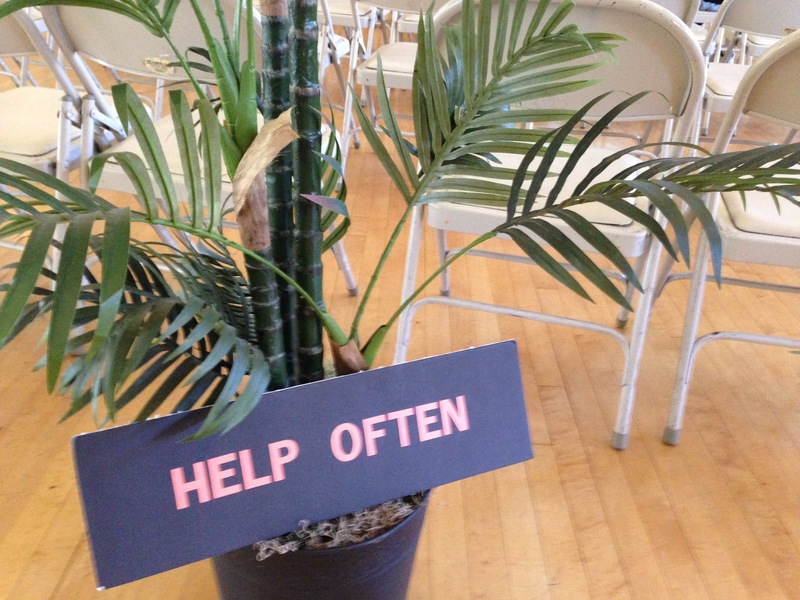 Help Often. Wonder More. 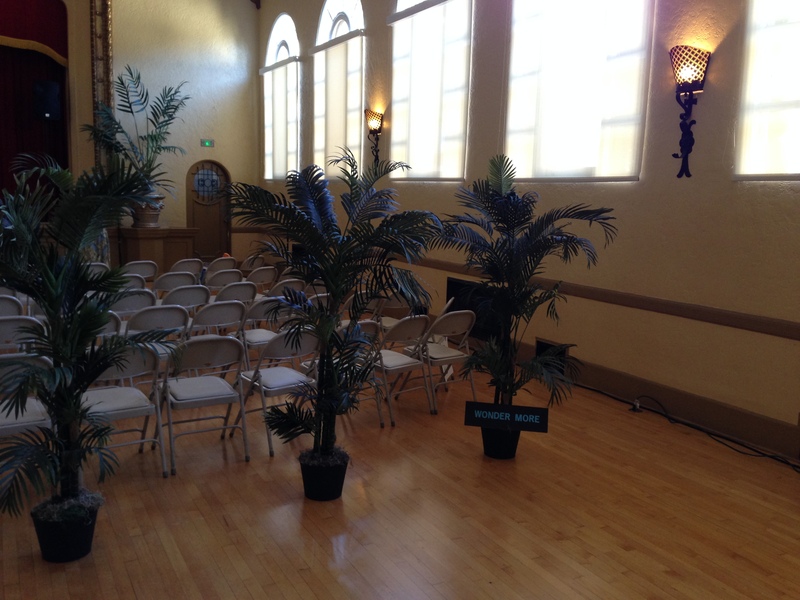 I took these photos of the palms they use to define a more intimate space for meeting. Look closely for their little signs of joy. 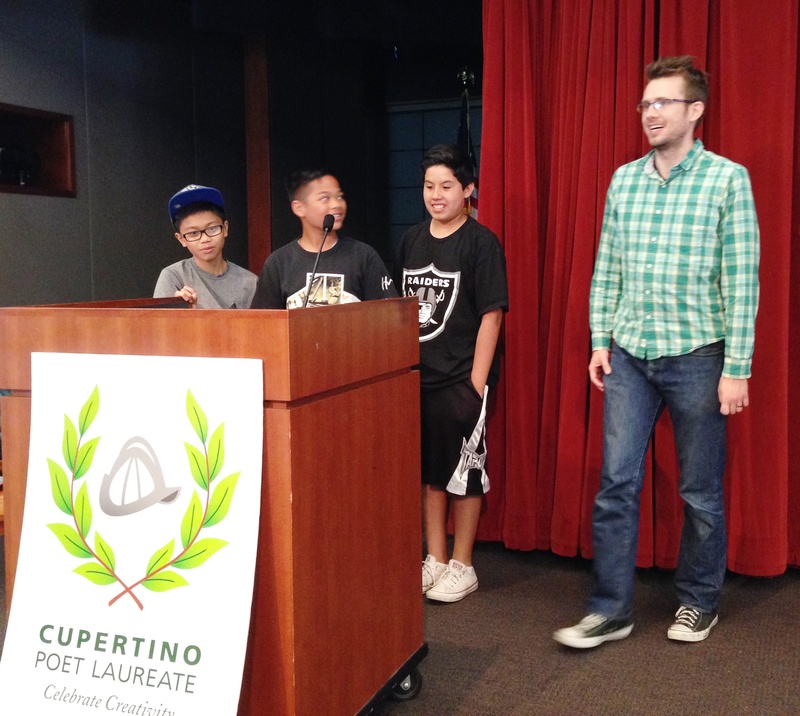 It was our first ever Cupertino Code Poetry Hack-a-thon and Slam. We had no idea what we would happen. But, in the end, plenty of people showed up, and we slammed six poems at the end of three hours of concentrated fun. I am so pleased and grateful to all who helped and came out for our wild and crazy tech + art event. Here are my photos of the slam portion of the event. There was video and I’m sure other photos, but for now, you’ll have to imagine us listening to the lecture and demonstration and eating our pizza. 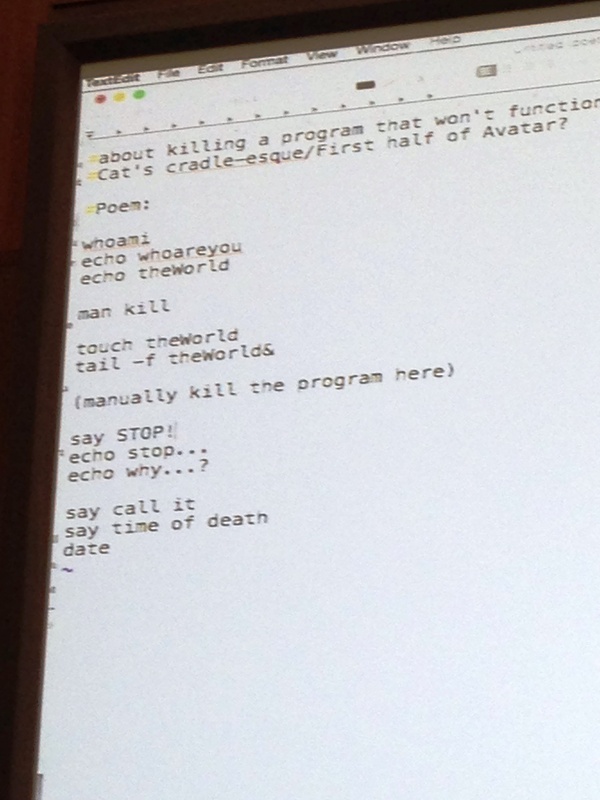 I am asking my friends what computer languages these poems were written in, so stay tuned for updates. 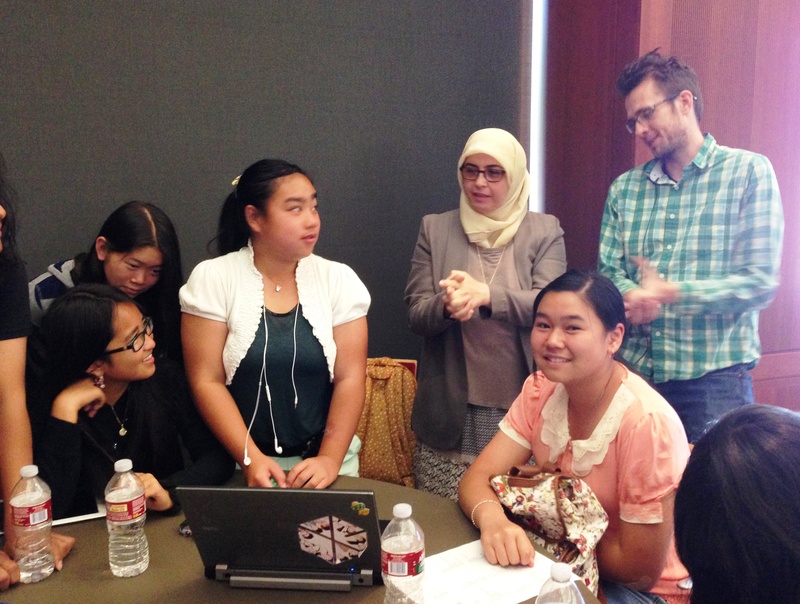 To our utter delight, Ms. Ghaidaa Mousabacha (language arts teacher from Morrill Middle School in San Jose) brought many of eighth-grade students to our slam. 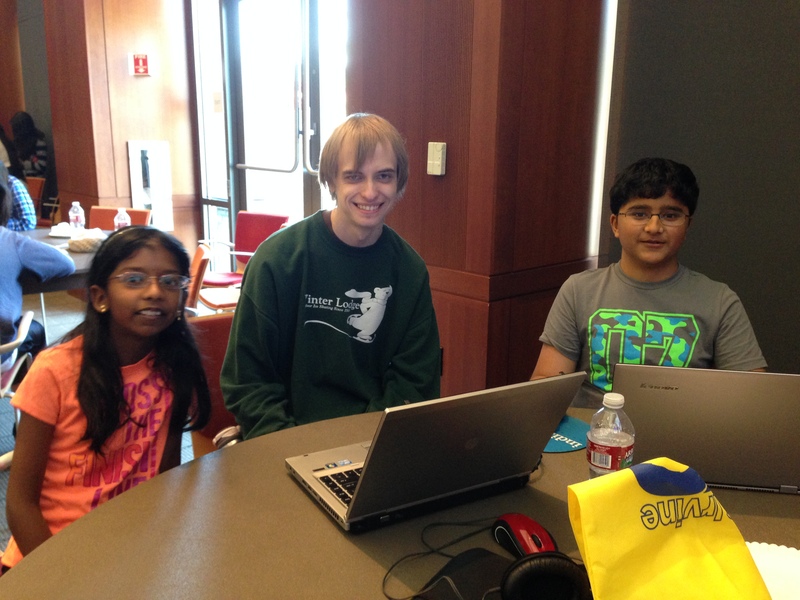 There were three tables of Ms. M’s students. 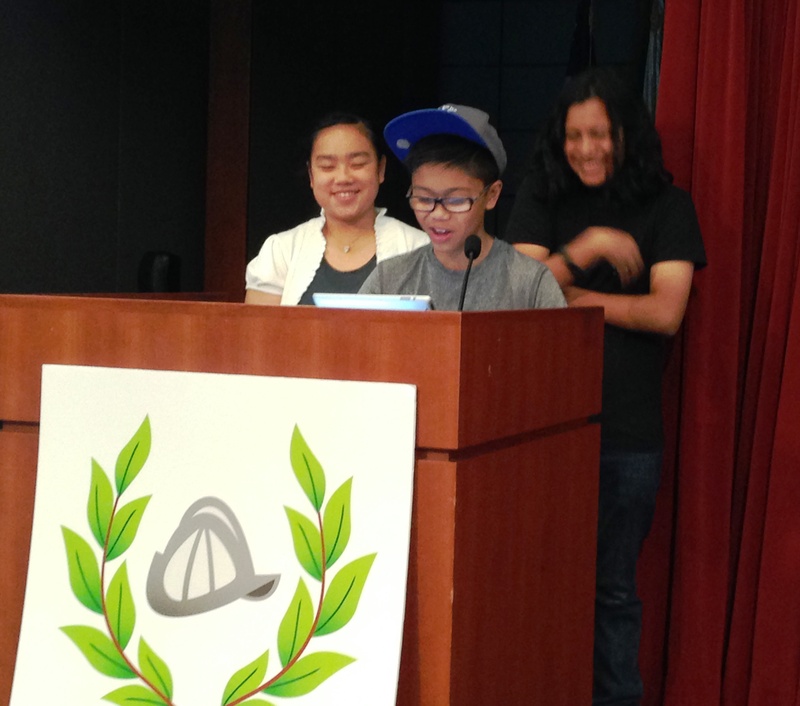 They loved the pizza, but I think they truly enjoyed the poetry and the coding (for which they had no previous experience!) I was very inspired talking to Ms. M. about her love of teaching and her dedication to her students. 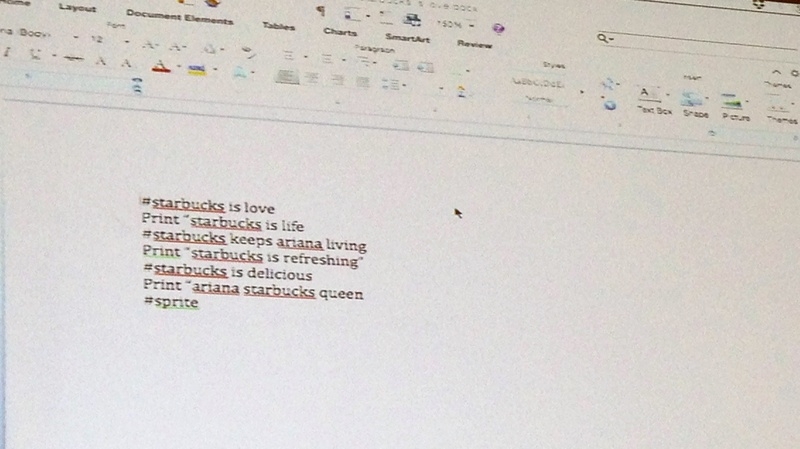 Table 2 wrote a code poem about Starbucks. 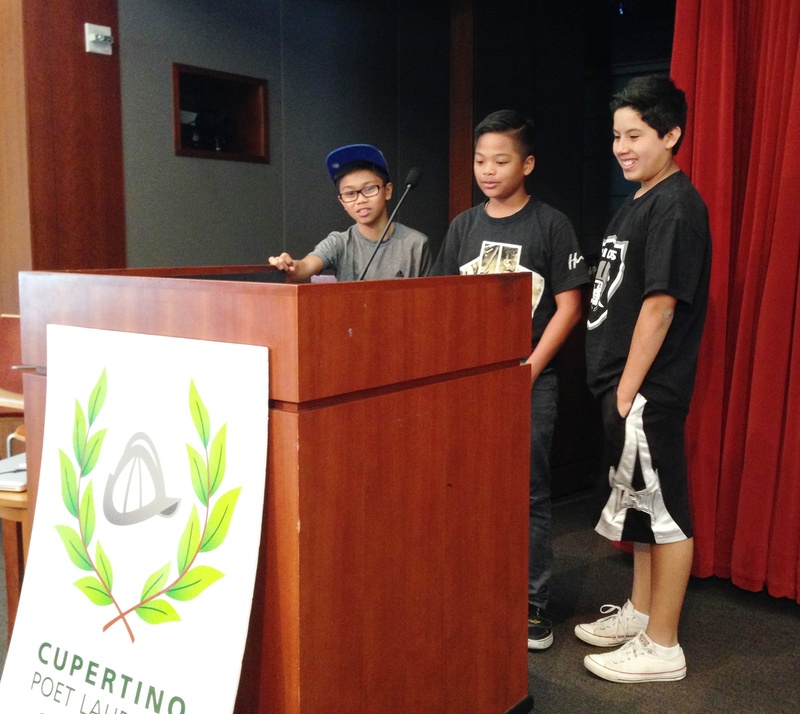 Three brave souls presented it to the audience. 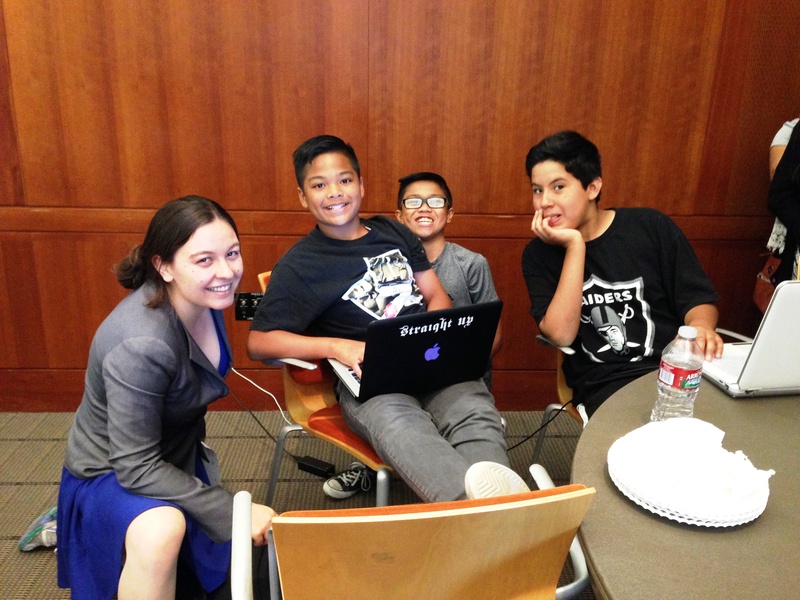 Table 3, also students from Ms. M’s class, worked on their poem with Stanford Code Poetry Slam founder Melissa Kagen and then presented it with another Stanford Code Poetry guest Ben Allen. 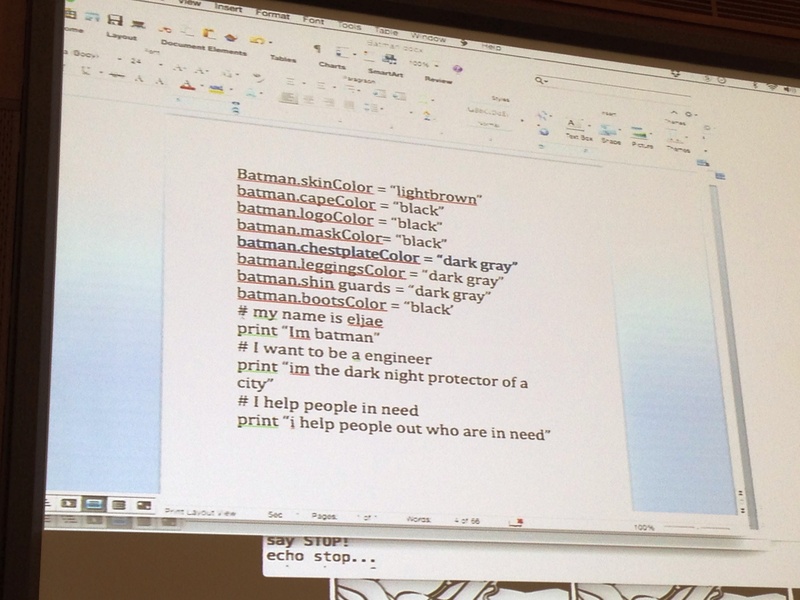 Their poem was about Batman. 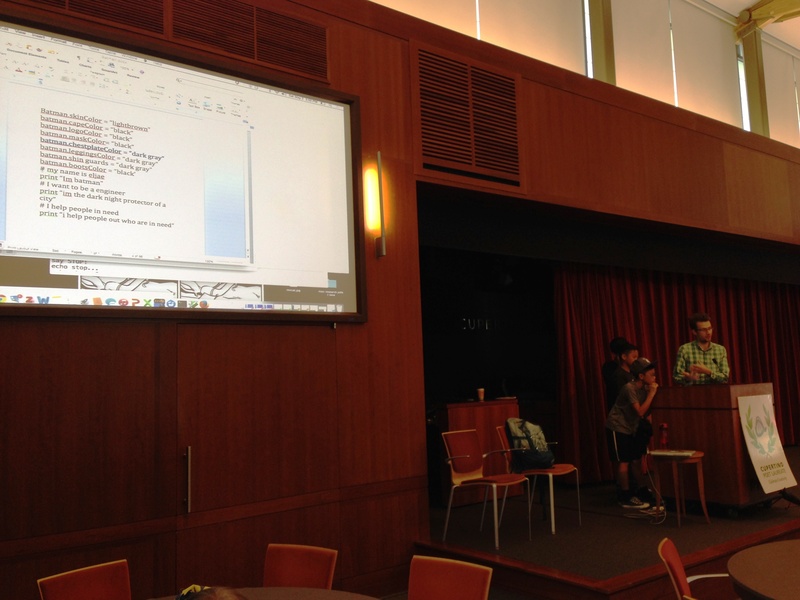 We had some technical difficulties projecting Table 4’s poem on the screen, but they did a fine job and had the audience laughing. You can see them working on their piece with Ms. M and Ben. 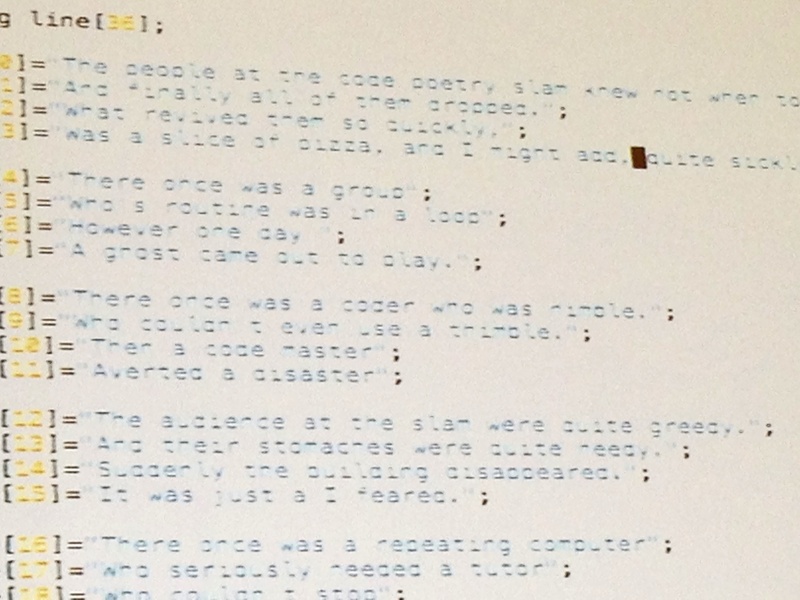 A local De Anza College student wrote the beginnings of a very interesting poem about Cat’s Cradle (is that a language?) 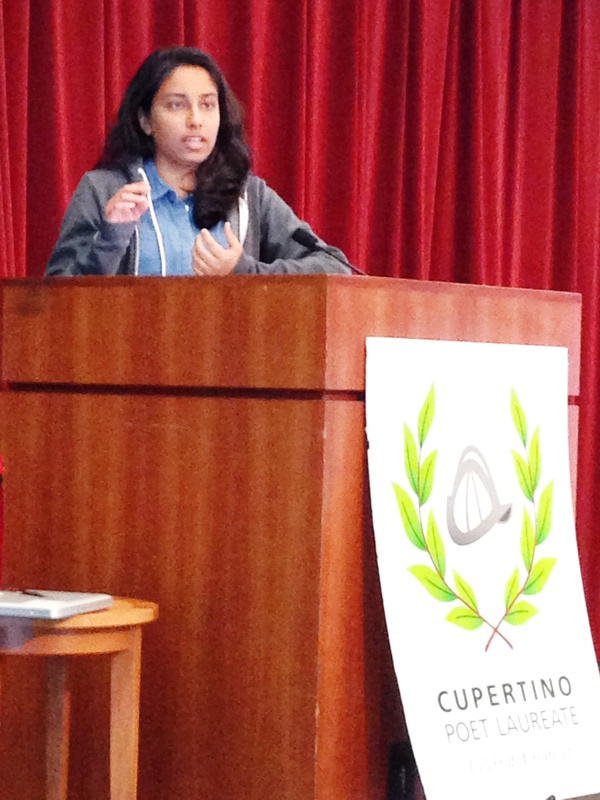 and I overheard her and Melissa talking about how she should keep writing it and submit it to the next Stanford Slam. Well-known local poet Dennis Noren also joined us for the afternoon. 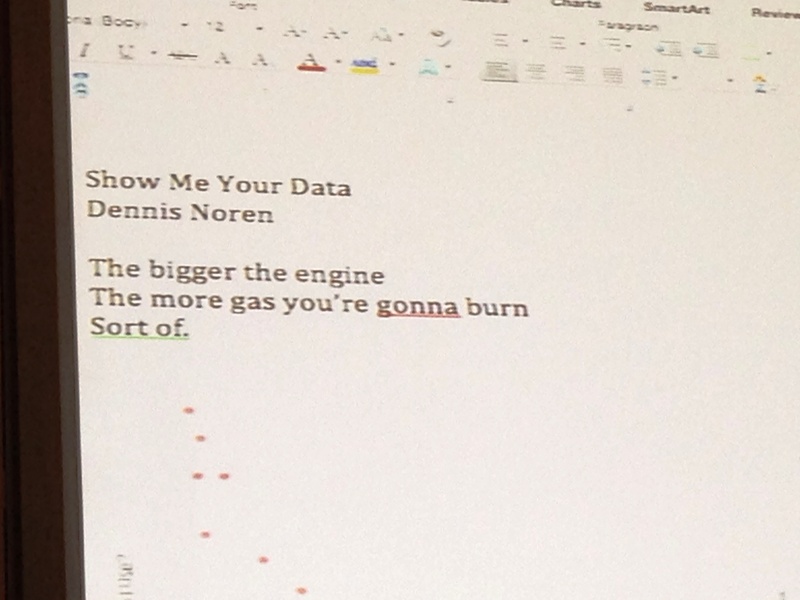 Dennis brought his background in economics, data analysis and poetry together in his piece. 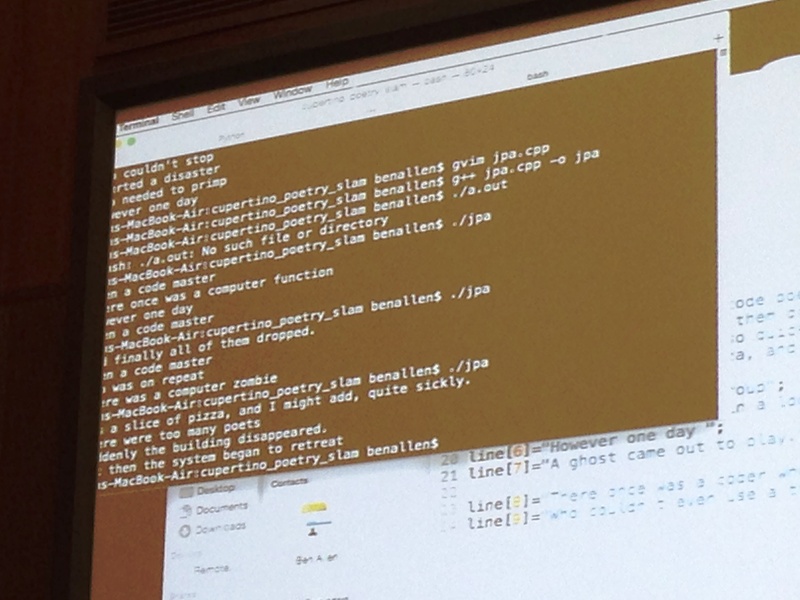 My photography skills weren’t always up to the task of getting poet and poem at the same time, but I did get a fun view of Dennis’s poem while he was writing/coding it! 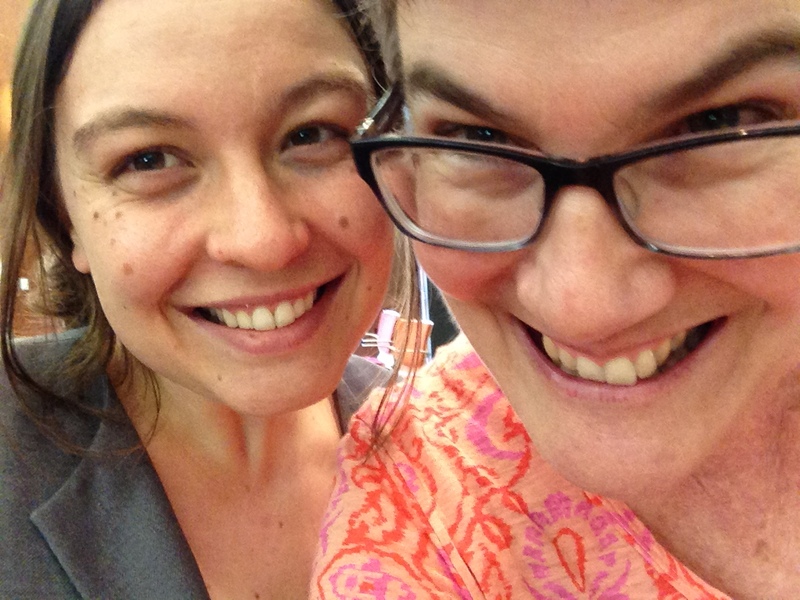 Here are a few more shots of the scene, including a silly selfie of Melissa and me — we had such a good time. My most heartfelt thanks to Adrian Kolb for bringing the pizza, and to Chris in the blue shirt who served as our great room and tech guy. 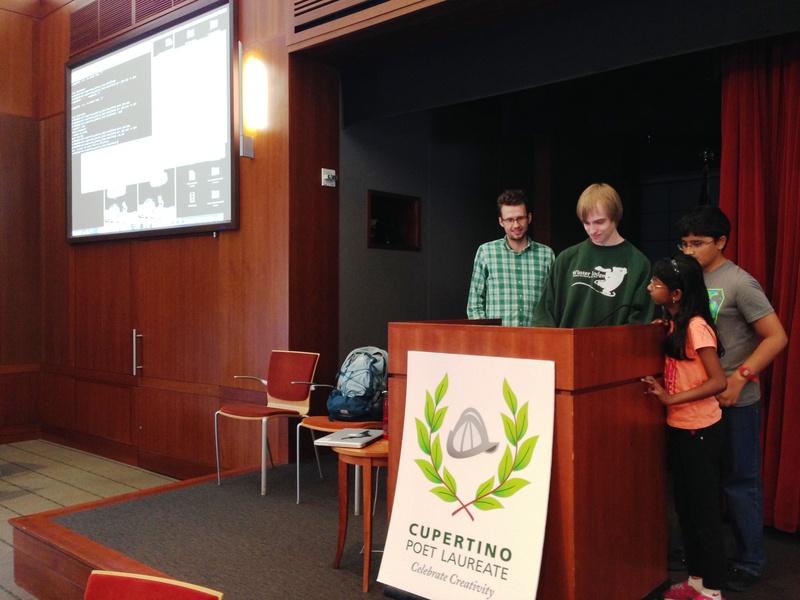 The City of Cupertino really went the distance this time, supporting us with space and technical assistance. Without them we wouldn’t have had such a successful event. P.S. 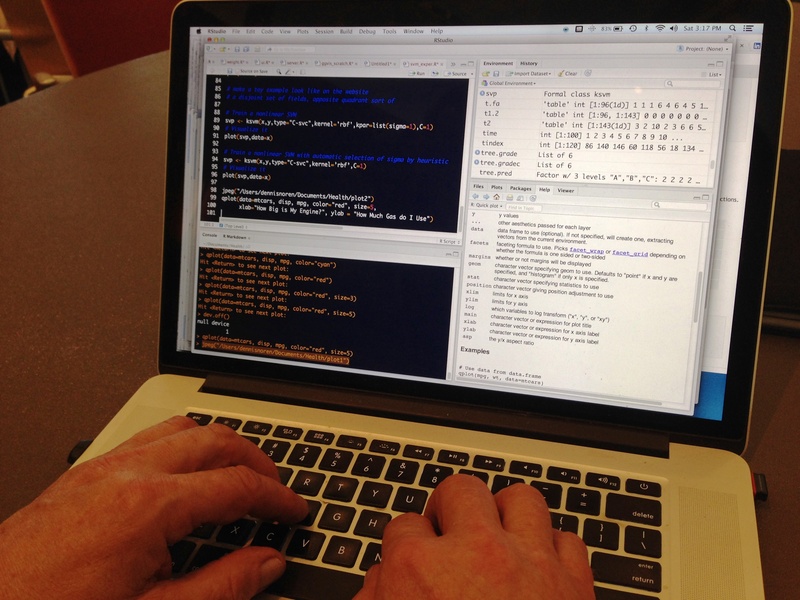 Did you know that there are over 9 pages of programming languages on Wikipedia? I was told yesterday that is is just the beginning. I remember my Dad writing in Assembly Language. I tried to learn Pascal in college. The possibilities are endless. 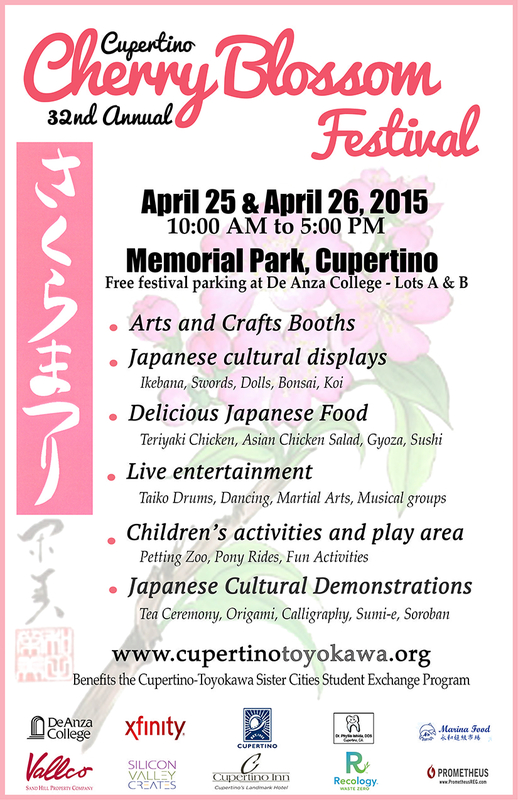 What a great day I had at the Cupertino Cherry Blossom Festival yesterday. I posted all my photos on Facebook, and you can see them at this link. David Perez, Erica Goss and I did our magic with typewriters and the imagination of strangers. Some of the poems were especially lovely. Like this one I wrote with a young man, based on his answers to my questions. 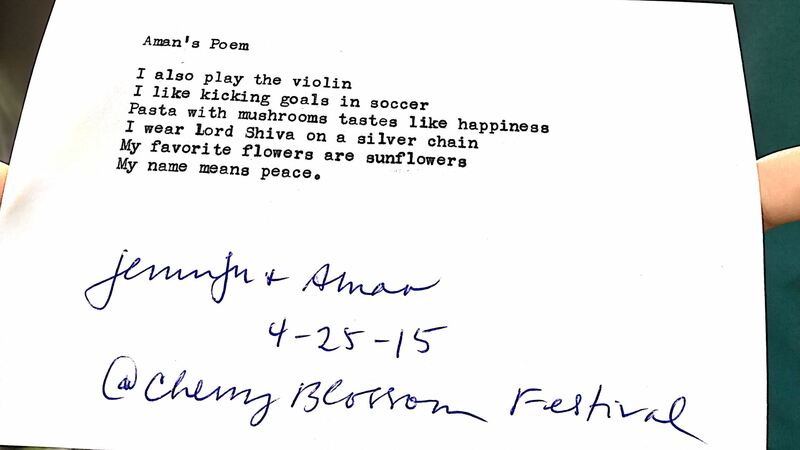 This poem, I wrote with this dad, because his kids were too shy, but they got into the poem! 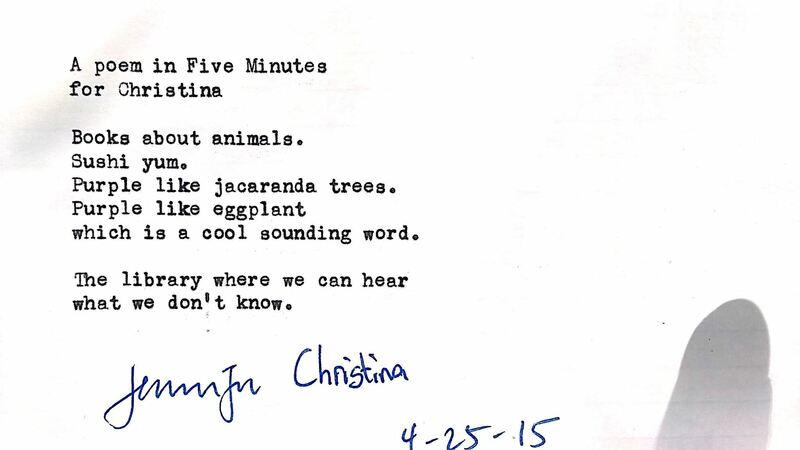 One of my favorite poems was a collaboration with a sweet young person named Christina, who kept saying “I don’t know” when I’d ask her things. Funny what appears in poems. 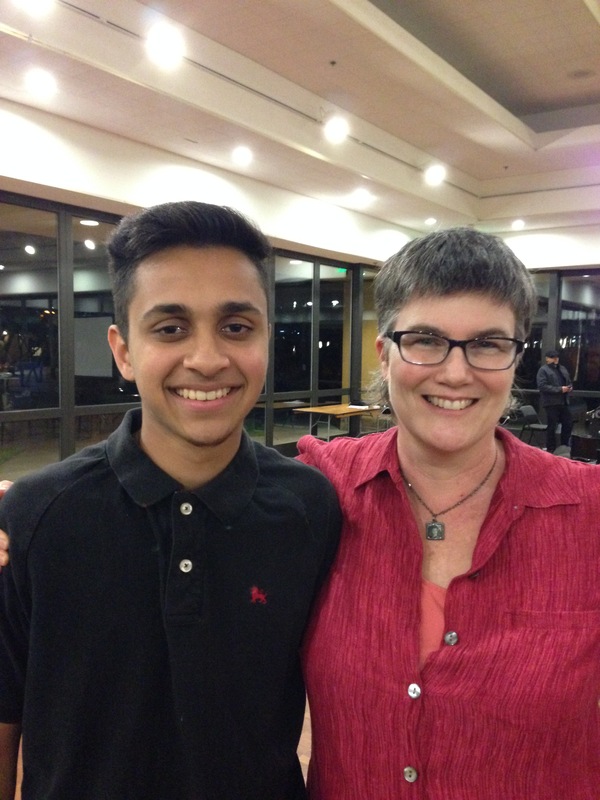 As part of my April activities, I co-hosted a workshop for teens at the Cupertino Library with David Perez. 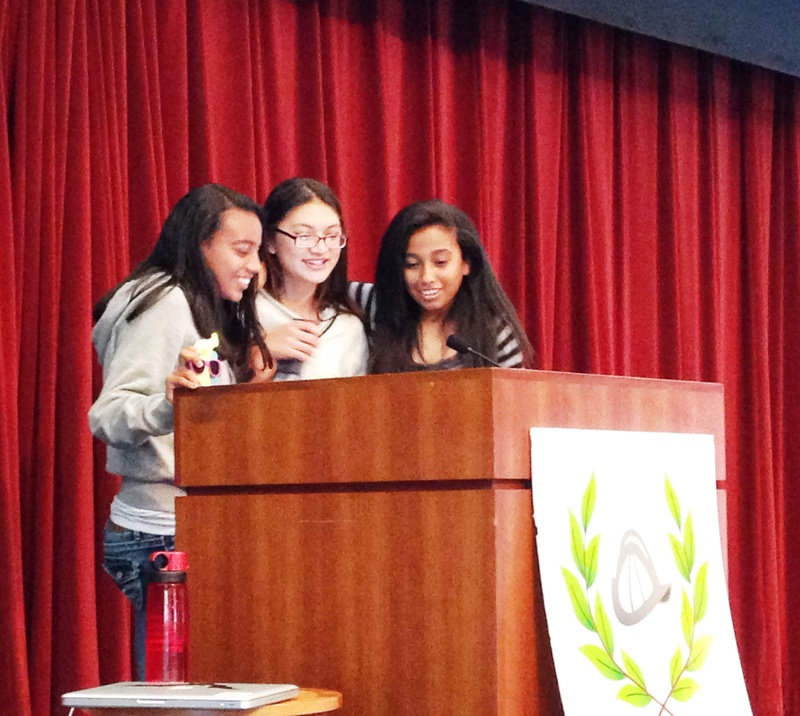 Read about the fun we had and read the poems written by three students who joined us. 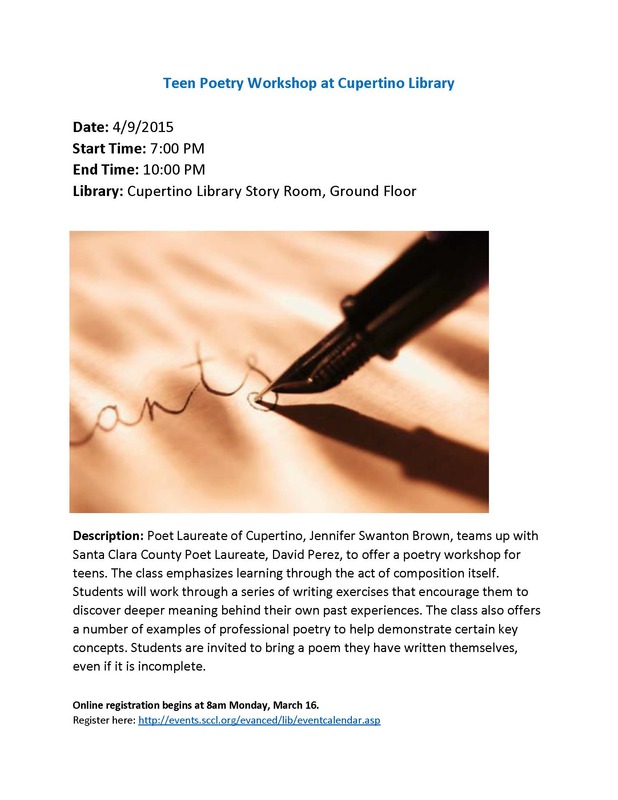 Please join me and my friend David Perez, the current Santa Clara County PL, this Thursday evening at the Cupertino Library for a poetry workshop. 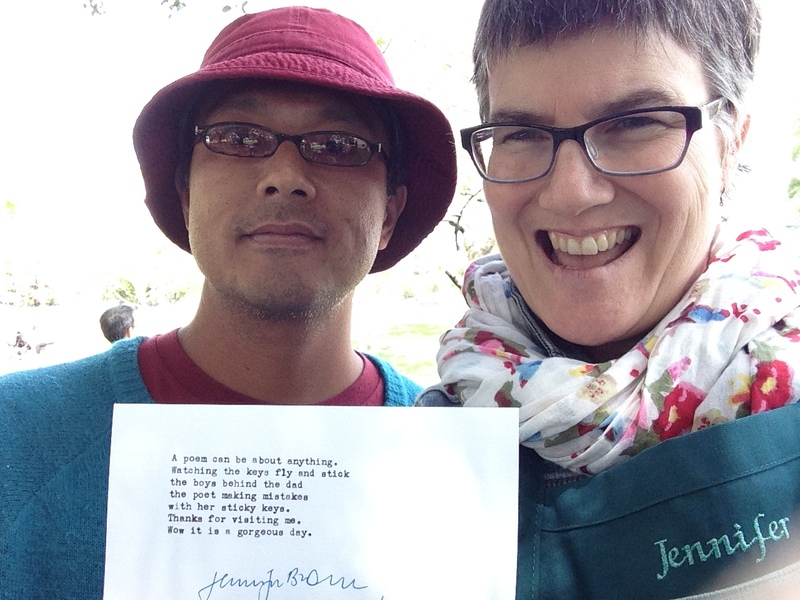 Celebrate National Poetry Month with us! I’ll warm up the crowd with a poetry warm up full of colors and David will run his part of the workshop in his inimitable way. 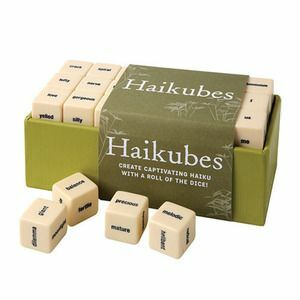 Bring a poem of your own, or come ready to write and hang out. 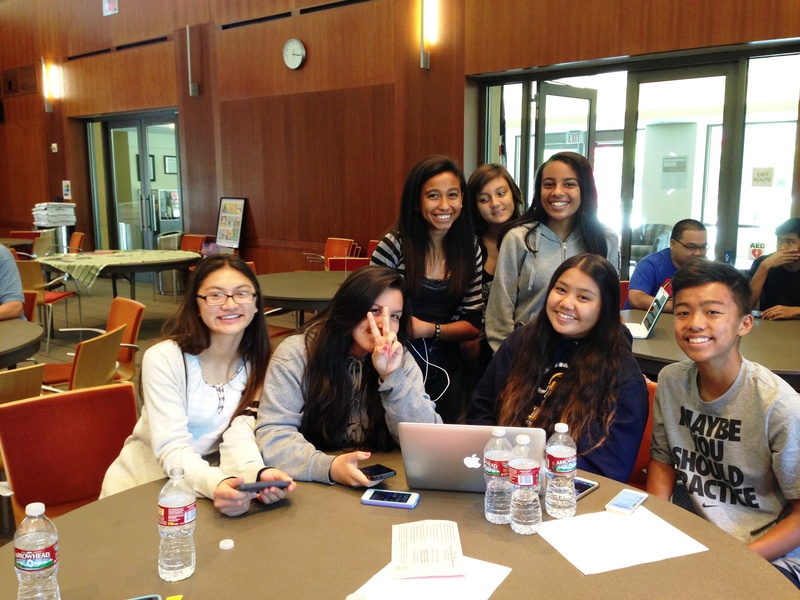 Register at the library website at this link. Hope to see you there! I had the honor to serve at the judges table for the State Championships for POL again this year. Click through here to read about my adventures. 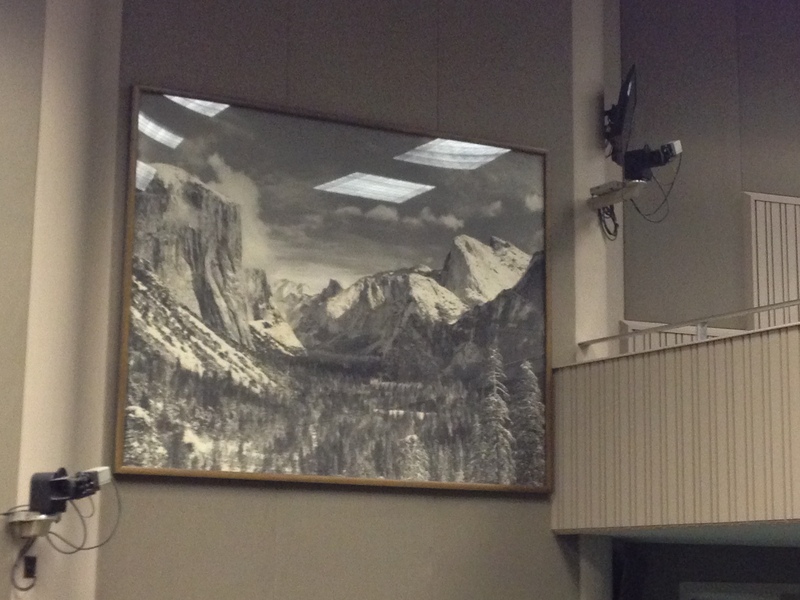 There were some great old huge photos on the wall of the chamber where we had the finals. 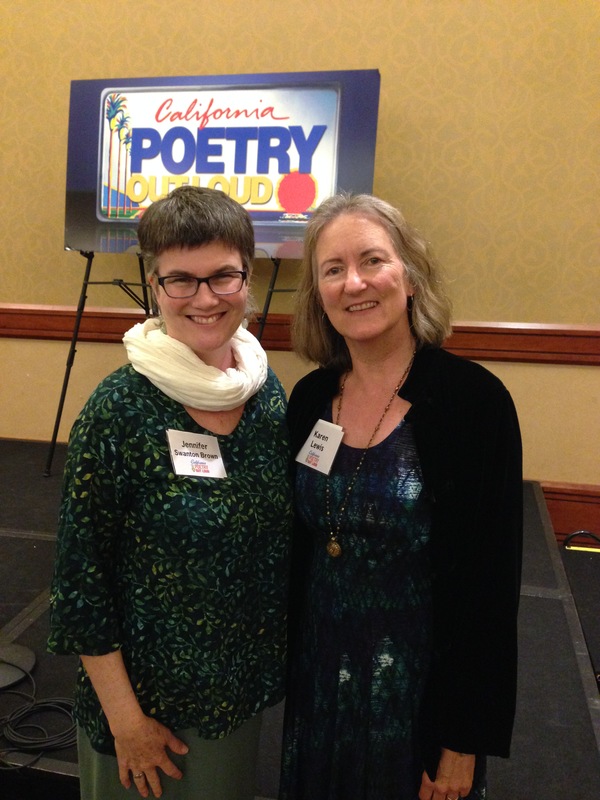 Karen Lewis, poet-teacher and past board member from California Poets in the Schools, and me taking a moment away from judging. 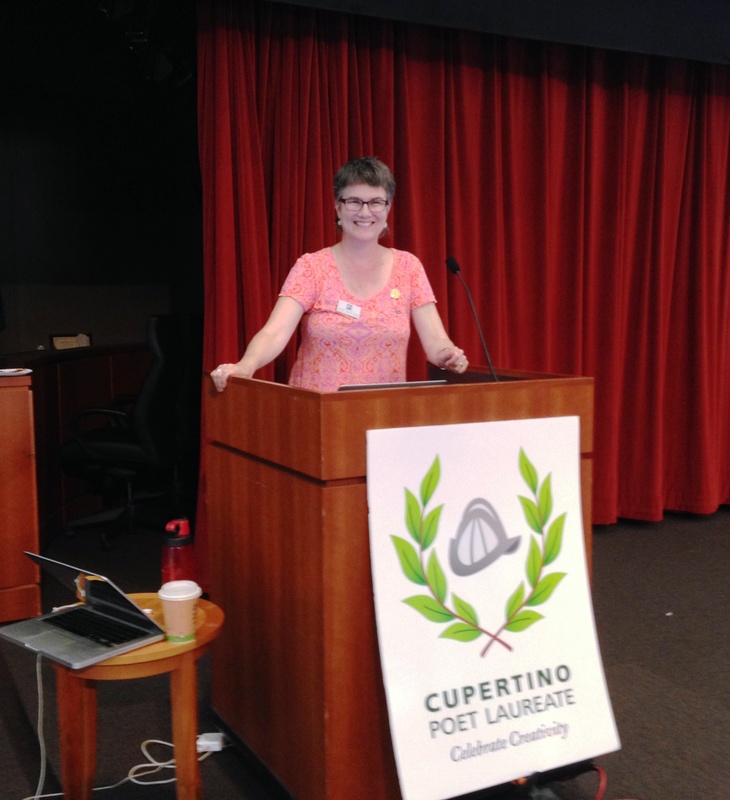 Earlier in March, I had the honor and pleasure of reading with my friends, past and present Poets Laureate in Santa Clara County, and wonderful wonderful teen poets. The students read their poems on the theme of immigration — some of them related their own experiences of home, experiences of their families, or imagined experiences. I read a poem I wrote years ago, “Samarth’s Mom” — an observation of a young Indian mother with her children at our local elementary school. You can read it at this link, in the online journal Convergence. Here are some photos from that evening. 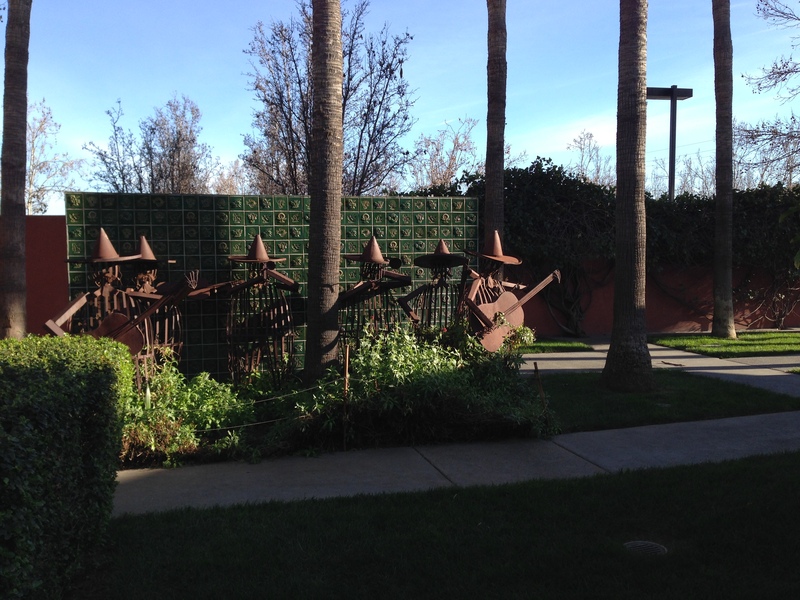 The event took place at the lovely Mexican Heritage Plaza in San Jose. Waiting outside the MHP auditorium. If you look closely, you can see Erica Goss waving from inside the window! 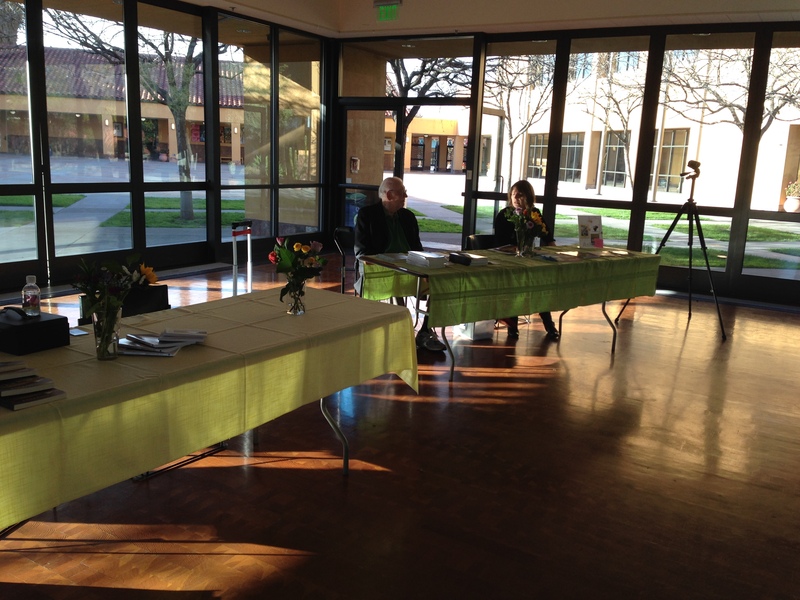 Past Poets Laureate of Santa Clara County, Nils Peterson and Sally Ashton, at their book signing table. Not having my own poetry books (yet!) 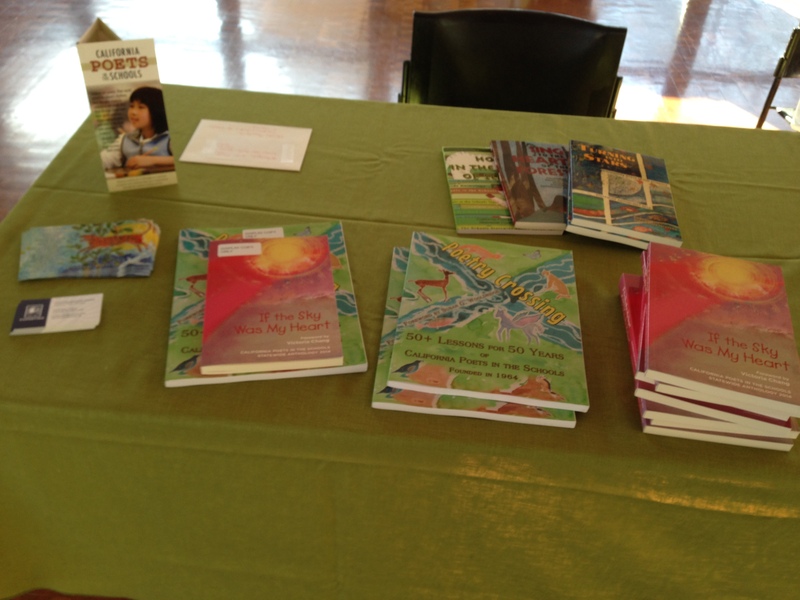 I sold anthologies and lesson plan books for California Poets in the Schools. I’m highlighting some local bookstores where I have purchased poetry in the past year. 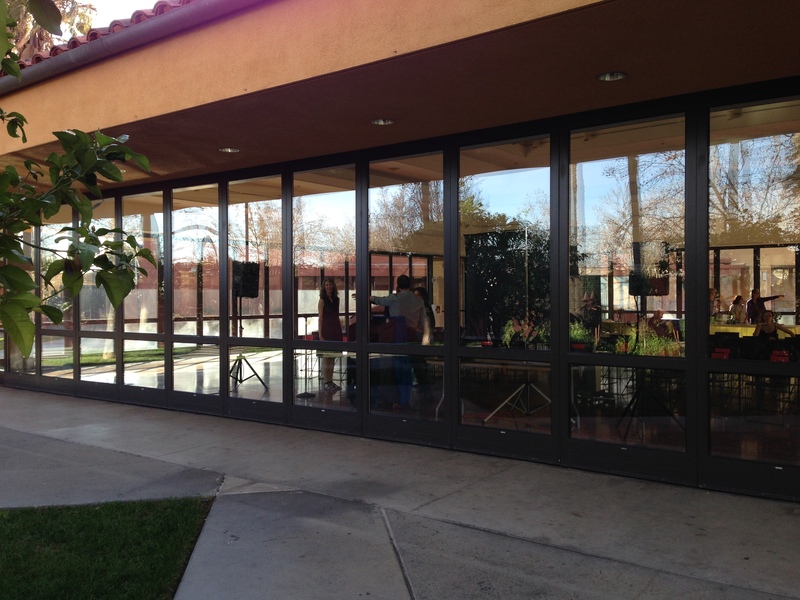 There were once lovely bookstores in Cupertino, but alas, no more. Fortunately, in our neighboring towns, there are some lovely ones. The Village House of Books, in Los Gatos, has a reasonably good sized collection, with a smattering of jewelry, cards, and candles to mix it up. Good section of children’s books (as in their photo above). I bought a gorgeous coffee table book there for my daughter’s birthday in December, as well as some best sellers in hardback and paper. Nice cards. Support local bookstores! This is a great one. Read their blog here.